As you know, we welcomed a new baby girl into our family about six weeks ago. Even though I am a third time Mom, I still do everything I can to ensure that she is kept safe and healthy. Chemicals are in just about everything, and are even in commonly used baby products like lotions, washes and wipes. Recently I was selected to review WaterWipes and share with my readers what I thought about them. First off, let me tell you a little about WaterWipes. These are baby wipes that chemical free, which means they put no perservatives in them. The packages will keep for about 15 months and should be used within a month of opening. Each package is packaged so that the contents are sterile. They are 99.9% pure water and 0.1% grape seed extract, so these truly are the safest thing to put on babies bottom. For these reasons, if your baby is struggling with a diaper rash, give WaterWipes a try. You will probably be just as impressed as I am. I didn't really know what to expect when we tried WaterWipes, but like I said, I have been very pleased. First and foremost, the wipes are very large and thick. Thicker than any other brand I have used. The thickness of the wipe allows you to get away with using just one of two wipes when you might have to use four or more with other messes. They are also incredibly soft wipes, so that along with them being all natural and 99.9% water makes them the gentlest thing on the market for your precious baby. My children all have very sensitive skin, and I have found that over the past week of using these wipes on princess that the pink tint she had has disappeared completely. Though she did not have a rash, WaterWipes has helped prevent a rash from happening! My babies mean the absolute world to me, and I know yours do to you. I want to keep them safe and sheltered from any harm in the world, and that includes harmful chemicals, so I will choose the chemical free water wipes for my princess from now on. The quality of the wipes cannot be beat, and there is no price you can put on the safety of your little ones! 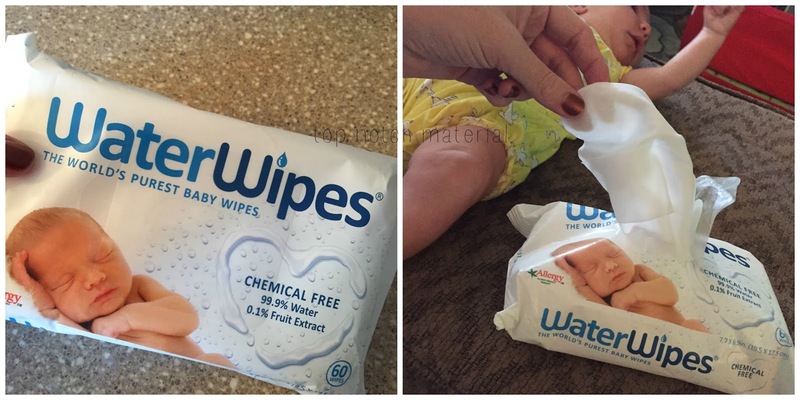 The more I learn about harmful chemicals in baby products, the more I love chemical free WaterWipes! *I-C will randomly select 1 winner from all program entries and will handle fulfillment of the winning prizes. The prize is not sponsored or fulfilled by Top Notch Material. We are simply promoting the contest hosted by Influence Central. Target about 6 miles from me is the closest place. The closest to me is Target in Conway, Arkansas which is about 50 miles from me.